The key is giving students the decision-making tools they need to shape their own learning experiences. Many teachers shy away from personalization due to its complexity. While the ultimate goal of technology-powered personalized learning is to minimize this complexity, the typical approach of pairing students with individualized content is reductive, at best. Scalable and sustainable personalized learning environments should instead maximize the power and potential of individuals and strengthen interpersonal connections. Technology-powered personalized learning simply cannot provide this. Personalizing learning doesn’t necessitate investing hundreds of dollars per child in expensive hardware or applications—but it does require an investment in people and in fostering relationships between them. This investment can be as minimal as a few simple changes in mindset and practice, ones that move away from personalizing for students and toward personalizing with them. The best part is, you may already be doing some of these things, and it’s critical to name them so you can continuously improve them. Culture is everything in a personalized classroom, which is why it’s critical for educators to invest in the people who build the classroom culture—the students. It’s a common misconception that personalized learning is controlled solely by teachers or a digital platform. In my experience, personalization is more sustainable if the students play a role in shaping their own experiences. By proactively teaching social and emotional skills, we teach students how to make responsible choices and shape their experience autonomously. This autonomous decision-making allows them to play a significant role in the act of personalizing their own learning. To achieve this, I start the year explicitly teaching emotional awareness and regulation using Leah Kuypers’s Zones of Regulation, a framework intended to foster self-regulation and emotional control that I refer to throughout the school day. Originally developed for students with autism, it guides students to be aware of their emotions and impulses and to become independent in controlling them. When building routines for simple tasks like gathering materials, self-starting new tasks, taking risks, and rebounding from mistakes, I use Responsive Classroom’s interactive modeling, a widely accepted practice for not only showing students how to perform routines, but also helping them understand why such routines are important. The teacher models first, explaining each of the steps she takes along the way. Next, a few classmates model the routine, and then the whole class performs it. 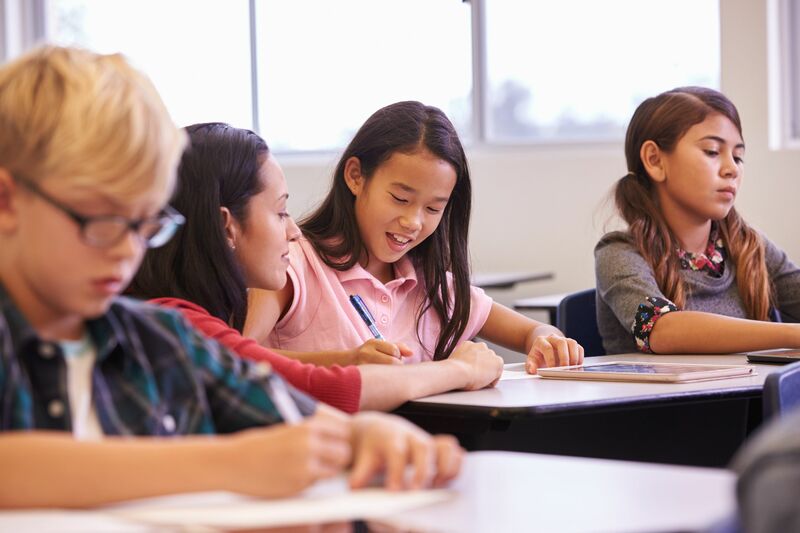 Interactive modeling concludes with focused reflection on students’ demonstration of the routine through positive reinforcement and compassionate redirection, when necessary. By explicitly building routines and social and emotional competencies, we set students up for later success when they must make choices autonomously. We often believe there is a linear relationship between choice and freedom, but it’s possible to be paralyzed by choice. Radical forms of personalized learning models provide too many choices, making the notion of a curriculum built with standardized outcomes undesirable. Even John Dewey, the father of progressive education, would advocate against a form of personalized learning where the kids call all the shots. In Experience and Education, he states that an adult’s life experience guides their decision-making around which experiences are “educative” and worth students’ time in the classroom. Using clear learning objectives (or standards) can help us build this educative structure, while still allowing space for learners to mold the curriculum with some autonomy. Building a curriculum fortified by standards sets up what I like to call a “flexible frame.” Think of it as being like a wire frame an artist might use to structure a clay sculpture. The wire is sturdy, yet flexible, allowing for choice and creativity through structure. Curriculum works similarly. Say you want to explore perimeter and area with your students, critical skills for late elementary students. After building a strong frame fortified by clear success metrics, you can engineer a set of learning activities that helps students explore these concepts and construct knowledge around them in a variety of ways: Students can play math games, solve a variety of open-ended tasks, or even build Lego structures with various areas and perimeters. The clearly defined standards build a frame that ensures that students are learning what they need to—the activities are the medium through which each child will personalize the learning through autonomous decision-making. When students are equipped for autonomy through explicit social and emotional learning and a structured, yet flexible curriculum, they operate with much less assistance from a teacher, allowing educators to spend time doing what really matters—interacting with kids. When my kids are exercising their autonomy, I’m able to circulate, assist, provide feedback, and even pull small groups together when necessary. But when technology is used to personalize on behalf of students, it often acts as a prohibitive intermediary between the teachers and students. It chips away at connection, adds complexity to routines, and can even lengthen feedback loops. Feedback is the life force of the personalized learning environment, and it’s much more nuanced than personalized learning technology would have you believe. Sure, advanced technology can assess on our behalf and perhaps even provide bits of feedback. But we must remember that learning is an emergent and serendipitous conversation defined by interpersonal interactions. Our time is better spent giving meaningful feedback and working with students to make learning more personal. We must stop personalizing on behalf of our students. By partnering with them and building opportunities for autonomy, we begin sharing the responsibility of making learning personal. This makes personalized learning scalable, sustainable, and helpful in enriching the connections between humans, which is, after all, the most personal way to learn.